If you're installing a sound card in an existing PC, power down your system and unplug all power connections. This is a precaution you must follow when working on the inside of a computer. If your PC already has a sound card installed, then you will need to remove it first. If there's no dedicated sound card installed already, and the computer just has standard onboard audio (ie included in the motherboard) just move onto the next step. Remove the old sound card by firstly unplugging all connections to the card such as speaker cable connections, and then pull the card straight out from its slot on the motherboard. Do this slowly and carefully. You may need to rock the card back and forth a bit so that you can pull it out. Only handle the card by its metal edges and avoid touching any electrical bits. Remember to only handle the card by its metal edges and to avoid touching the electrical parts of the card, and keep the card in its protective anti-static bag until the moment you are ready to install it. Install the new sound card into the slot where the old one was, or into a spare PCI/PCI-E slot that you can find on the motherboard. The card should slide into its slot easily, and then firmly make sure it's securely in place all the way. You may also need to screw it in depending on the card. Replace the computer case, and that's it for actually physically installing a sound card. To use the card you'll need to plug your speakers or your headset directly into it using the correct ports. 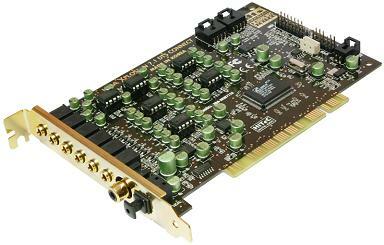 Once your sound card has been fitted you will also need to download and install the latest drivers for that model from the manufacturer's website. You should always get the latest drivers online as the ones that may have come with your sound card on CD/DVD may be outdated, and you always want the latest drivers so your card runs at its best and any potential bugs/issues are fixed. That's basically it for installing a sound card, which is an easy component to install. If you want to learn how to install all of your components and add-on components, see our complete guide on how to build a PC step by step, which includes precise, indepth detail as well as accompanying high-quality photos from our latest build to help you follow along, plus a whole lot more such as software installation, planning your build, maintenance, troubleshooting, upgrades and more.